Minot State University’s Dome will come alive with tradition, color and movement. Native American dancers and drum groups from throughout North Dakota and neighboring states and provinces will compete during the 28th annual Native American Spring Honor Dance and Powwow Celebration Friday and Saturday (April 28-29). More than 1,000 people attend annually; the event includes the acknowledgement of achievements, competitive dancing, vendor and information booths and food. 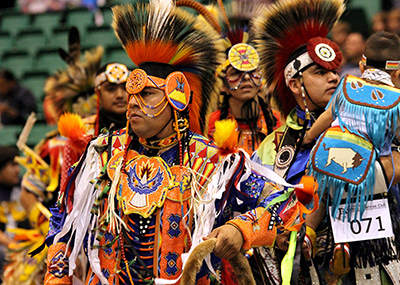 The powwow is one of the largest student activities on campus. This event, sponsored by the Native American Cultural Awareness Club, the Native American Center and the university, will honor all 2017 graduates. Typically, an average of 19 Native American students graduate from MSU each year. Competition registration starts both days at 10 a.m. Food booths open at 11 a.m. along with dance competitions and the sale of Native American arts and crafts. Two Grand Entries, the time when all of the dancers enter the arena, are scheduled for 1 and 7 p.m. each day. Charles Moran, Mandaree, will be the emcee and Wade Baker is the arena director, with SloughFoot as the host drum group. Myron B. Johnson/Nathan J. Goodiron Post 271, Mandaree, will be the honor guard. Following the 1 p.m. Grand Entry on Friday, NACAC will present a buffalo hide painting depicting the coming together of the Mandan, Hidatsa and Arikara Nation to the Three Affiliated Tribes. Shantelle Carey, an art major, is currently painting on it as part of her senior capstone project. The hide will be painted left to right in story format showing the three tribes uniting. The painting will include the Souris River as a main theme, as all three tribes used to camp along it. Carey would also like to include the NACAC logo in the painting. Following the 1 p.m. Grand Entry on Saturday, NACAC will honor Nelrene Yellowbird, social work assistant professor, for her dedication to NACAC and the Native American Center. Yellowbird will retire this spring. To honor the graduates and their families, a buffalo meal will be served in Buckshots on the lower level of the Student Center at 5 p.m. The Mandan Hidatsa Arikara Tribal Ranch/Buffalo Project donated the buffalo. The meal is free to the public. The Honor Parade, in which all 2017 graduates are invited to participate, follows the Grand Entry on Saturday at 8 p.m.
Dance competitions will be held for elders, men, women, teens, juniors and tiny tots. The competition for men includes traditional, grass and fancy dancing. Women's dance competitions include traditional, fancy and jingle styles. Cash prizes will be awarded. Admission to the Spring Honor Dance and Powwow Celebration is $3 for ages 12-55; it is free to children under 12, elders and MSU students, faculty and staff. In addition to MSU, the Three Affiliated Tribes provided support for the event. For more information, see the 2017 powwow poster or contact Mennem, at 858-3365 or Annette.Mennem@minotstateu.edu. Minot State University is seeking public comments about the university in preparation for its periodic evaluation by its regional accrediting agency, the Higher Learning Commission (HLC). The university will host a peer review campus visit Oct. 30-31, 2017. The team will review the institution's ongoing ability to meet HLC's Criteria for Accreditation. Minot State University has been regionally accredited since 1917. The public may also submit comments on HLC's website at www.hlcommission.org/comment. Comments must address substantive matters related to the quality of the institution or its academic programs. Comments must be in writing. All comments must be received by Sept. 30, 2017. Minot State University students, faculty and staff will share their research and scholarly work at the 2017 Research Poster Session Thursday (April 27) in the Student Center Atrium, 11 a.m. to 1 p.m. In addition to the poster presentation, a collection of abstracts will be published. The event is free and open to everyone. For questions, contact Deanna Klein, Faculty Research Committee chair, at Deanna.Klein@minotstateu.edu. The Minot Symphony Orchestra wraps up its 91st season, “Music of the Sphere,” April 29 with “Storytellers.” The concert begins at 7:30 p.m. in Ann Nicole Nelson Hall. Minot State University students, faculty and staff are admitted free with a current ID. Ticket prices for adults are $25 main floor and $30 balcony; senior citizen is $20 main floor and $25 balcony; students 13-17, $15; children, $10. Symphony patrons are invited to join Anderson for a 6:30 p.m. preconcert lecture for an inside look at the symphony program. For more information, visit the MSO website. Minot State University’s National Student Speech Language Hearing Association will sponsor the sixth annual Miles for Smiles walkathon Sunday (April 30) in Roosevelt Park, beginning at 10:30 a.m.
Walkers fundraise for Operation Smiles, a mobilized force of medical professionals and volunteers who provide safe and effective reconstructive surgery for children born with facial deformation such as cleft lip and palate. Each surgery costs $240. In the past six years, the Department of Communication Disorders and NSSLHA have provided over 200 surgeries through fundraising. For questions, contact Lesley Magnus, professor of communication disorders, at Lesley.Magnus@minotstateu.edu or miles4smiles@gmail.com. Robert Kibler, co-chair and professor within the Division of Humanities, concludes the Two-Minute Lecture Series May 3 with “The Sinister Side of the Pastoral Tradition.” He will be in the Beaver Creek Cafe by the curved wall at 12:30 p.m. For questions on the series, contact Kibler at Robert.Kibler@minotstateu.edu. Staff Senate is hosting its fifth annual silent auction May 4-5 in the Conference Center. All proceeds will go to Serenity Therapeutic Equine Programs. STEP was established in 2011 to provide therapeutic riding to individuals with disabilities and equine-assisted activities and therapies to families and businesses. Monday (May 1) to May 3, individuals may drop off donations (new or gently used items; please no clothing items) at the public information director’s office (Administration Building, second floor). May 4, individuals may browse and bid on items in the Conference Center, noon to 4 p.m. May 5, browsing and bidding continues in the Conference Center, 8 a.m.-1 p.m. Then, winners will be notified, and they can pick up their items in the Conference Center, 3-4:30 p.m. Unclaimed or unsold items will be donated. For questions, please email Mindy Rudnick, Staff Senate president, at Mindy.Rudnick@minotstateu.edu. Minot State University College of Business will hold its annual Recognition Banquet May 5 at the Grand Hotel at 5 p.m. This event acknowledges students for academic and organizational success. Scholarships are provided by individuals and organizations to support all of the CoB programs. For questions about CoB, contact college.business@minotstateu.edu. 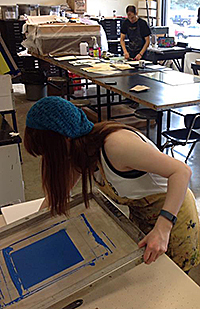 Minot State University’s Flat Tail Press will host a celebration of printmaking May 5-6 in Hartnett 215E. MSU students, faculty and staff and community members will join printmakers from around the world to participate in the worldwide Print Day in May event. The group of artists will make prints with paper sized 11”x15” and use a variety of processes. This is the third consecutive year that Flat Tail Press and MSU have participated in the Print Day in May event. In 2007, printmakers at Monterey Peninsula College, California, began devoting the first Saturday in May to printing. It grew into a worldwide event, including participants from various countries on five continents. Beginning May 5 from 6 to 9 p.m. and running through May 6 from 8 a.m. to 6 p.m., the students, faculty and staff and community members will print using many processes including woodcuts and screen prints, lithographs and alternative photographic processes to make their editions. All are invited to attend this free event and learn about the different printing processes and help the participants with their prints. Follow Flat Tail Press for progress posts throughout the day. For questions, contact Stander at 858-3297 or Ryan.Stander@minotstateu.edu. All Minot State University faculty and staff members have been invited and are encouraged to attend the annual Employee Recognition and Retirement Event May 10 in Ann Nicole Nelson Hall, 3-4:30 p.m. The recognition program begins at 3:30 p.m. in Ann Nicole Nelson Hall. President Steven Shirley has advised supervisors to close offices where feasible to ensure the fullest attendance possible. Join colleagues as those marking five-year increments of service, those retiring and those receiving Faculty and Staff Achievement Awards will be honored. Minot State University’s Student Government Association hosted the North Dakota Student Association’s monthly meeting April 21-22. NDSA is a representative body of the student governments within the 11 North Dakota University System institutions. NDSA serves as a voice for more than 45,000 students in North Dakota. Andy Bertsch, MSU management professor, was a guest speaker. Topics included legislative session bills, the open letter project, task force management, and open educational resources. Also, the transition to 2017-18 NDSA officers occurred. 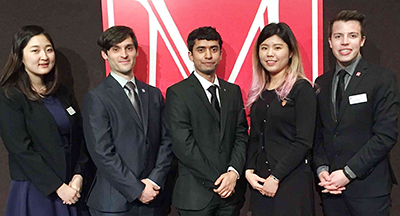 The MSU delegates, pictured left to right, included Ayaka Ohi, Kevin Gilgallon II, Bikalpa Ghimire, Skyler Yi and Aaron Richard. To learn more, visit NDSA, or contact Ghimire at Bikalpa.Ghimire@minotstateu.edu. April 26-May 4 — MSU Juried Student Art Show, Hartnett Gallery. April 26-May 13 — “Mugs and Monsters,” ceramics and soft sculpture by senior art students Rachel Alfaro and Kalyn Dewitt, Library Gallery. Amanda Allard, financial aid counselor, and Lindsey Benson, assistant financial aid director, recently passed the National Association of Student Financial Aid Administrators professional credentialing exams. Allard earned the NASFAA credential for verification, and Benson earned the NASFAA credential for return of IV funds. Kowan O'Keefe, POWER Center supplemental instruction coordinator and academic coach, gave an invited talk, “Geopolitical Implications of Climate Change,” April 2-6 at the American Chemical Society's 253rd National Meeting & Exposition in San Francisco. Sayeed Sajal, assistant professor of mathematics and computer science, delivered a TEDx talk, “The Beauty of Wireless Communication,” April 24 at North Dakota State University in Fargo. Sajal co-authored with M. B. Qureshi, S. Roy, S. Asif, Chad Ulven and B. D. Braaten, NDSU researchers and professors, "On using Biocomposite Filaments to Additively Manufacture Substrates for Microstrip Transmission Lines," accepted for presentation at the 16th Annual IEEE International Conference on Electro/Information Technology (eit2017), May 14-17, Lincoln, Neb. Sajal co-authored with S. Roy, M. B. Qureshi, S. Asif and B. D. Braaten, NDSU researchers and professors, "A Study of Microstrip Transmission Lines on Substrates Created using Additive Manufacturing and Flexible or Semi-rigid Filaments," accepted for presentation at the 16th Annual IEEE International Conference on Electro/Information Technology (eit2017), May 14-17, Lincoln, Neb. Sajal co-authored with M. Obaida and Israt Jahan, researchers at NDSU and Texas A & M University, "Analysis on Interactive Data Race Checker: IDRC," accepted for presentation at the 16th Annual IEEE International Conference on Electro/Information Technology (eit2017), May 14-17, Lincoln, Neb. Sajal co-authored with Md Obaida, Eric Nelson, Rene Ee and Israt Jahan, researchers at NDSU and Texas A & M University, "Static Analysis on Interactive Sensitive Data Exposure Detection," accepted for presentation at the 16th Annual IEEE International Conference on Electro/Information Technology (eit2017), May 14-17, Lincoln, Neb.